Bryant University continues to grow and expand. Today, the latest building addition, the Interfaith Center, will be presented in a dedication ceremony led by President Ronald K. Machtley. Machtley states that “the Center completes the ring of facilities, which encircles our campus core. This arc now includes key spaces dedicated to mind, body, and spirit.” Not affliated with any religion, Bryant University wanted a facility that would be open to all religions and denominations. 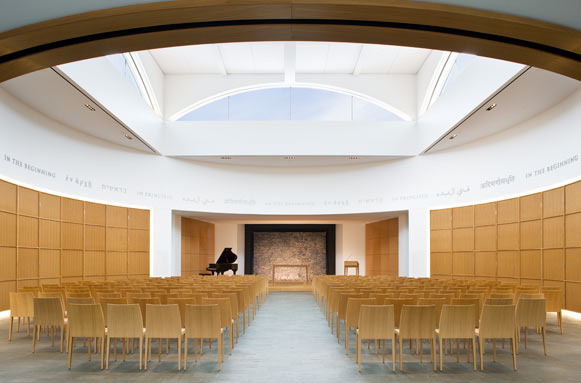 The Interfaith Center will be an inviting and inspirational place for all students to practice their faith. The Center features a large chapel that can seat 200 and an adjacent reflection sanctuary provided for smaller groups or personal use. The 10,000 square feet facility was designed by Gwathmey Siegel & Associates Architects. The wood paneled main chapel features a ceiling to floor water wall designed to provide further reflection. Curved windows within the arched ceiling allow sunlight to illuminate the chapel. For more details, be sure to read the Providence Journal's article about the building and dedication. Malcolm Grear Designers designed the interior and exterior sign system including the inspirational texts in English, Greek, Hebrew, Latin, Arabic, and Sanskrit which encircle the chapel's barrel vaulted ceiling.